Vegetables and fruit provide you with natural sugars, dietary fiber, vitamins, minerals and other important micronutrients. Although vegetables and fruit are essential foods in a healthful nutrition plan, certain types of produce have some potential disadvantages. Portion control and other simple measures, however, typically make it easy for you to overcome these disadvantages and enjoy the many flavors and benefits of eating vegetables and fruit daily. Starchy vegetables, such as white and sweet potatoes, release large amounts of sugar when digested in your small intestine. These vegetables have a high glycemic index, meaning they are likely to cause a significant uptick in your blood sugar level after eating. This response may be problematic if you have diabetes or prediabetes. You can potentially blunt the effect of white or sweet potatoes on your blood sugar level by eating some protein or fat in the same meal with these vegetables. Many types of fruit and vegetables contain sugars that do not break down in your digestive tract. When these sugars reach your colon, bacteria feed on the undigested carbohydrates, releasing gases. If your diet includes several types of gas-producing vegetables and fruit, you may experience increased intestinal gas. Vegetables that commonly increase intestinal gas include cabbage, broccoli, Swiss chard, Brussels sprouts, cauliflower, asparagus, mustard greens, collard greens, kale, turnips, parsnips, onions, bok choy, radishes and rutabaga. Vegetables in the bean group, such as lentils, chickpeas, kidney beans, navy beans, black-eyed peas and soybeans also increase gasiness. Types of fruit that commonly increase intestinal gas include apples, plums, pears, peaches, cantaloupe, watermelon and grapes. Nonprescription alpha-D-galactosidase capsules or tablets taken before eating gas-producing vegetables or fruit help prevent excess intestinal gas. The enzyme breaks down the sugars responsible for increased gas production before they reach your colon. Some people have a low tolerance for the fruit sugar fructose, a condition known as dietary fructose intolerance. If you have this condition, eating fruit may cause abdominal cramps and diarrhea. Among people who do not have dietary fructose intolerance, overindulgence in fruit such as prunes, plums, cherries, apples, pears and peaches can also cause diarrhea. These types of fruit contain a high concentration of sorbitol, which is a natural laxative. 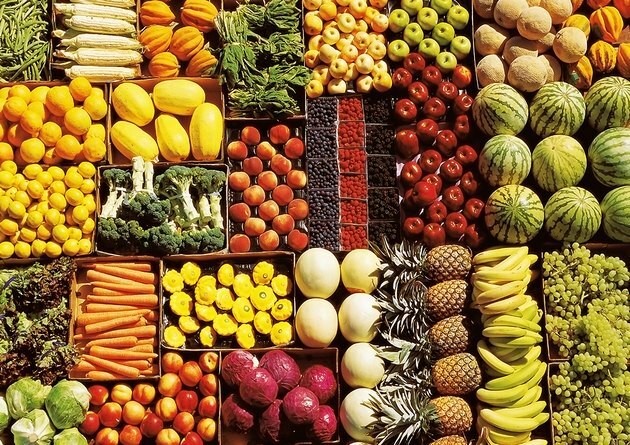 Some types of fruit and vegetables contain a large number of calories in a small volume of food. Examples of high-calorie fruits and vegetables include dates, raisins, figs, grapes, sweet cherries, avocados, corn, white potatoes and sweet potatoes. Although these fruits and vegetables have high calorie counts, you can work them into your nutrition plan if you control portion sizes and keep your daily calorie intake within target range. Does Chewing Gum Cause Intestinal Bloating?